duncanchrist has no other items for sale. 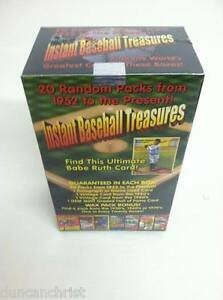 1 VINTAGE PACK/20 BOXES! JUDGE MANTLE JETER OHTANI? Prompt shipment great seller thank you! Very Smooth Transaction! I would do business with again. Great Communication, Fast Delivery, Hopefully can due Business together again! A great buying experience! Thank you! Great box, very satisfied with entire end to end experience! great product! just what i needed! product was ok didnt hit one card over the value of 12 dollars just unlucky. This was a great purchase. I have a pretty extensive collection and I am always looking to expand what I have so this product gave me that exact opportunity. I was able to get some really nice cards out of this box, including a relic card for Albert Pujols' bat which was really cool (on top of other various hits).